I love how this one turned out. 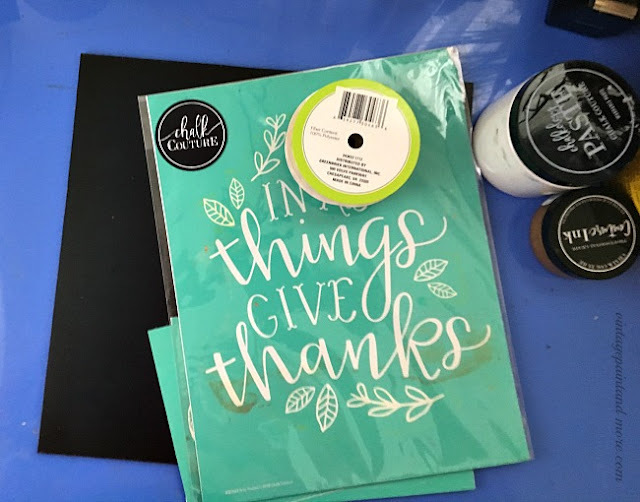 I used a 10"x10" black chalkboard Hubby cut for me and my Chalk Couture transfers, chalk paste and couture ink. Then I added a bit of glitzy ribbon to make it more festive for this holiday. 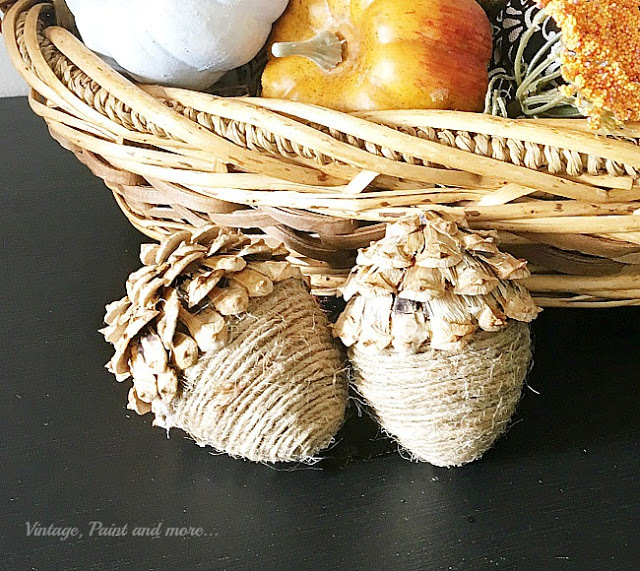 I have it sitting on a table here with my black vintage truck I found at Target's Dollar Spot a while back and a set of wood beads I made. Let me take you through the steps on how to make this very easy and quick little project. This is a picture of the items needed to complete this project. I have links to them above that you can obtain them from. 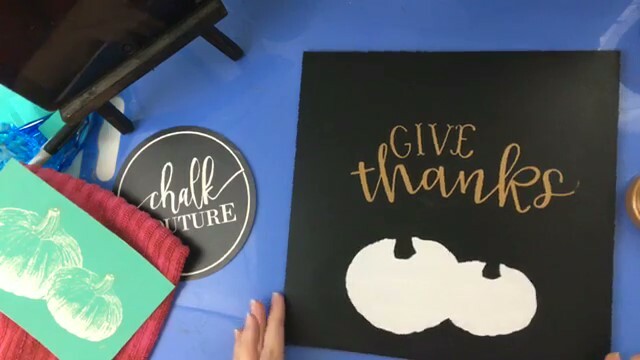 Before you start with the transfers and paste you need to make sure you wax your chalkboard with a furniture paste wax. I use Minwax. This is just a light coat put on that you lightly buff to prevent the transfer from stretching when you remove it. Before applying any transfer to the board you want to "fuzz" it. This is done by placing the transfer sticky side down on a towel and pulling it back up a couple of times. This will also aid in ease of lifting the transfer from the board after chalking. So, let's begin the chalking process. The first step I did was cut the pumpkin pieces from the "Fresh Pumpkins" transfer and apply the base pumpkins to the board smoothing around the edges of the pumpkins to ensure they adhere. The rest of the transfer can be just lightly pressed down - this will make it easier to remove when done. Now, apply white chalk paste to the area with a squeegee after stirring it well. Spread the chalk paste around the silkscreen area evenly then remove any excess and replace it in the chalk paste jar. With an easy steady motion pull transfer up while chalk is still wet. 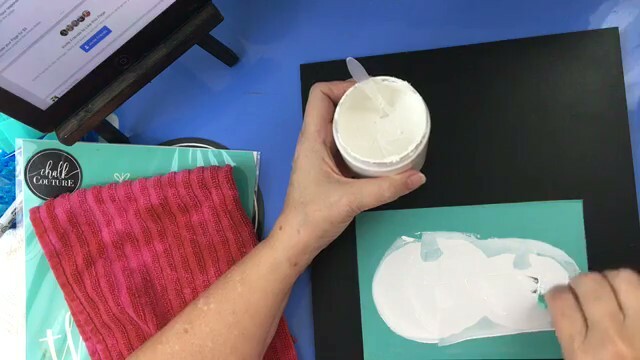 Place transfer in a pan of water until able to clean it. You can wait until the chalk air dries before moving to the next step or you can speed the drying process up using a heat gun or a hairdryer. When the chalk is completely dry apply the "Give Thanks" transfer as shown above. 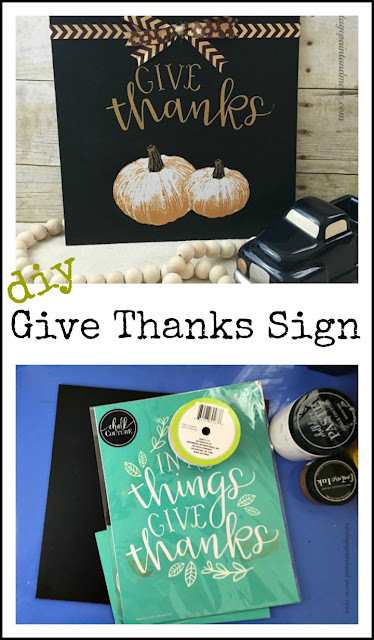 You want the words "give thanks"centered over the white pumpkins. 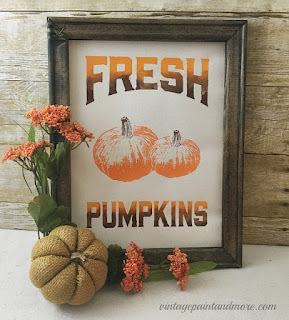 Press around the edges of the letters ensuring adherence but do not press the transfer down on the pumpkins themselves. Now, apply the shimmery copper ink to the words "give thanks" only. Remove the transfer slowly and steadily and place in the pan of water to be cleaned. This is how your board will look at this point. 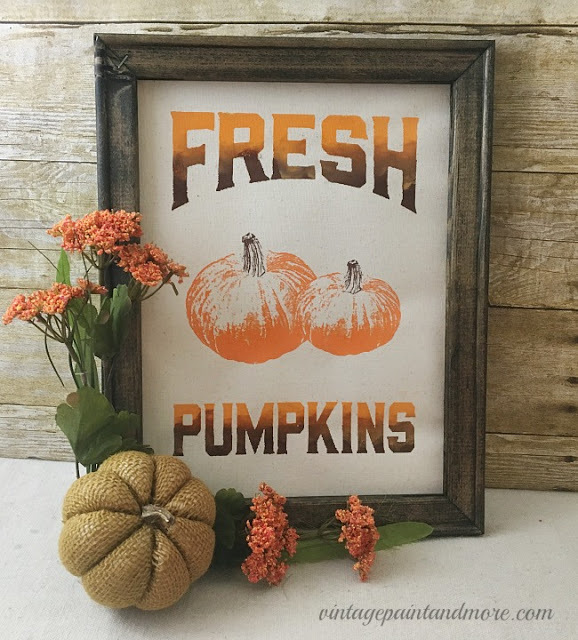 Next, apply the detail transfer of the pumpkins on top of the white pumpkins lightly. Do not press down hard as the transfer may pull up some of your chalk when lifted. Apply the shimmery copper ink to the transfer and when evenly distributed pull the transfer up slowly and steadily. This is how your board will look. The shimmery copper just pops off the black and the white. 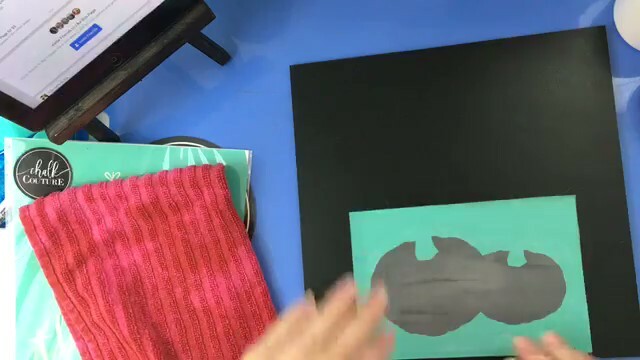 Ink takes longer to dry than the paste. You can use a heat gun or hair dryer for a faster drying time or you can just let it sit and air dry. I usually leave it to air dry. This is not permanent and can be removed with water so you can reuse your board for other holidays. However, if you want it to be permanent merely spray it with a clear sealant such as Mod Podge or Rustoleum. Lastly, I tied a bit of ribbon around the board to dress it up and make it more festive for the Thanksgiving holiday. 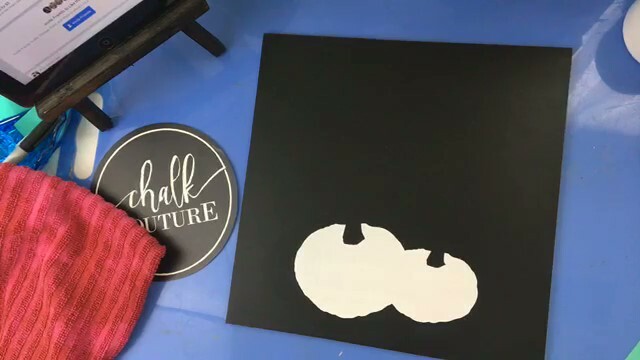 Here's my YouTube video showing the step-by-step process to make this sign. 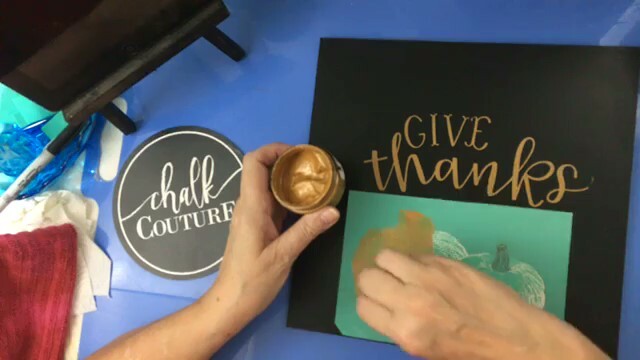 Chalk Couture reusable silk screens, chalk paste, and Couture Ink are so easy to use and can transform almost any surface in just a few minutes. 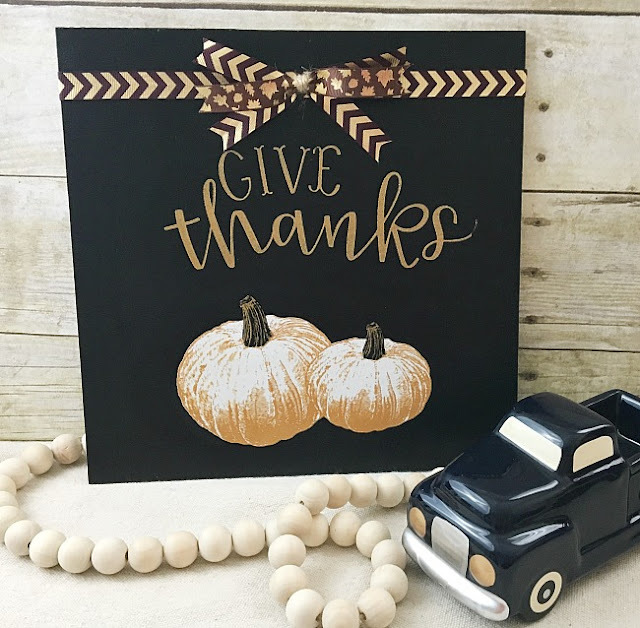 They have so many cute transfers to choose from along with 32 colors of chalk paste and 20 colors of ink They also carry several types of chalkboards and surfaces for you to use, however, you can use your own to make some adorable home decor and/or gifts to give. 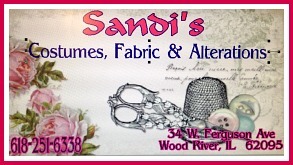 I am an Independent Designer for Chalk Couture and you can obtain your supplies in my shop. If you have any questions just comment below or message me and I will get back to you. 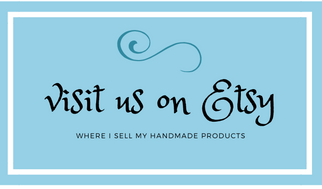 You can follow me on Facebook at Vintage, Paint and more or join my VIP group Chalking With Cathy where I have special bundles, giveaways, and make and takes. 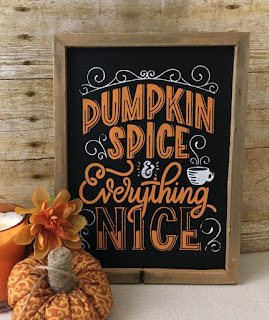 If you feel you would rather purchase this sign than make it you can find it in my Etsy Shop. If you would like to see more of my Chalk Couture projects just type chalk couture in the search box on the sidebar. Until next time have a wonderful day and go make something you love.